The following is a snippet from a statement made by Former Congresswoman Gabrielle Giffords and Navy combat veteran and NASA astronaut Captain Mark Kelly, the Co-Founders of the gun violence prevention organization Americans for Responsible Solutions (ARS). Tomorrow I will tell you more about Gabrielle Giffords. Her quote is quite apt. The current situation can’t be accepted as the norm. Something has to give and it’s got to be the assault rifles. None of us will forget the images of Gabrielle Giffords and her bravery. If the US doesn’t take note of what she says there is no hope. We all hope her wise words do not fall on deaf ears. After all, history has proven that words are more powerful than swords. A good thought to hand onto. I hope America wakes up. No one needs an AK-47 to defend their home. This cannot be our new normal! Please no! 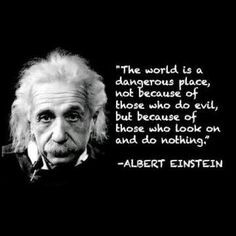 Love the Einstein quote and so true! I wonder what it will take to sway the balance. There is always a tipping point.